Happy New Years and welcome to 2012! I have had a warm and productive holiday season and hope you have, too. I’d like to take a moment to look back on the past few months in which I kept busy but posted little. Lessons in the craft world learned in 2011 include the following. -I recently completed my first hat and despite some pattern misreads discovered in the final product, I think it turned out pretty well for a first try. An inherent problem in crafting any wearable item is producing a properly fitting garment. This Harry Potter beanie was designated as a child’s pattern but the large version I made seems more like an oversized adult hat. This has reminded me the hard way that it’s worth the effort to take some measurements and to never knit (for someone else) on autopilot. -A major project of late has been working on homemade stocking stuffers including lip balm, sugar scrubs, fizzy bath salts, bath bombs, melt and pour soaps, and lotion bars with my friend Sarah Rentz. While the sugar scrubs have been the easiest product to create the bath bombs have proved the most interesting. We have had inconsistent results with the bath bombs stemming from water consistency issues and surface area to volume ratios but this will be an excellent product once we perfect it. One memorably failed experiment involved changing our source of salt from a coarse Mediterranean sea salt from Kroger to a bulk package of dead sea salt from an online company. The result was a sticky mess of a continuous reaction between the citric acid and the baking soda in the matrix of the (apparently) higher water content of the Dead Sea salt. The lovely fizz when the bath bomb is dropped in a nice warm bath is the result of carbon dioxide bubbles and additional water as biproducts of the chemical reaction between an acid and a carbonate. However, when the reaction begins inadvertently in a small plastic jar creating more water further fueling the reaction, the result is a sticky bubbly mess that hopefully isn’t sitting on your carpet at home. Luckily we identified the culprit as the new salt source and this will not be an issue in the future. I love that simple chemistry can help or hurt in these situations making it important to understand the ingredients used in each project. -While Sarah and I played with melt and pour soap bases, we really weren’t thrilled with the simplicity of the process. Luckily, we met Joann, a legitimate homemade lye soap maker from Stanton, KY and she offered to show us her techniques. She makes beautiful and potent smelling lye soap that is very impressive in both formulation and presentation. She welcomed us into her own home and we could not thank her enough for her insights and support. I can not wait to put these skills into use and create such a beautiful and useful product. -In December, Brad, Staci, and I visited the Open Studio event at the University of Kentucky Reynolds Art Building. Not only did we get to see a diverse assortment of student projects in print making, 3D sculpture, graphic design, fiber arts, paintings, drawings, and pretty much anything else you can think of, but we also got to see a live aluminum pour into sand molds created by patrons of the show at the open air metal arts studio. This was amazing. Sparks were flying, sawdust was burning, metals were molten and students were wearing protective leather smithing type outfits and welding masks. This was art and science on steroids. As a result, one of my New Years resolutions for 2012 is to participate in the 20th annual campus Iron Pour when it rolls around this fall. Last year’s event even included a patina workshop that I would gladly attend if repeated this year. I can hardly wait for October but at least there will be plenty of time to plan my project. I have more resolutions, but these seem sufficient to keep me busy for the immediate future. I hope you are lucky enough to look back at 2011 with positive feelings and if you can not that you maintain hope for the future and the will to make the best of new opportunities. Happy New Year and I look forward to writing again soon. In honor of the release of Harry Potter and the Deathly Hallows Part Two, D3Z suggested that we undertake an appropriately themed knitting project. My post-squeal response was two-fold. 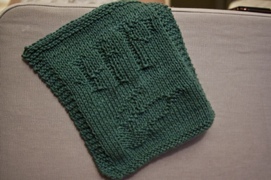 I planned to first knit this Harry Potter and the Golden Snitch washcloth pattern. My reasoning behind this selection was simple: instant gratification. This project took me slightly longer than the duration of Harry Potter and the Deathly Hallows Part One which is what we were watching for maximum inspiration. I used a nice jungle green Brown Sheep Company cotton gifted to me by my good friend Rebecca Wheat at Lily of the Valley. My secondary reason for choosing this pattern was to familiarize myself with the capability of simple knit and purl stitches in two dimensional work to create simple pictures. In the future I would like to apply these techniques to design personalized gifts for my friends. How cool would it be to get hand knit wash clothes personalized to your pop culture preferences? I can already see the boomstick, light saber, and ork themed cotton dish towels in my (or maybe your) future! The second project I mentioned to Adam and Dez, was this Gryffindor hat set. I prefer the ones with the minimalist gold stripe. Unfortunately, that particular evening I did not possess the appropriate yarn for the job. So there I am knitting away on my snitch washcloth, when lo and behold Adam returns on his moped from an emergency trip out for superglue with a lovely skein of Caron Simply Soft Autumn Red yarn saying “This should get you started.” I was so touched I promised him the first hat. This is still a work in progress and I’ll keep you updated on the progress. I did see the movie tonight and felt it was a fitting end to the series. I began reading Sorcerers Stone in sophomore year in high school intrigued by the rumors of such a brilliantly crafted world. Little did I suspect what a huge pop culture phenomenon this series would become. Over the years I have devoured the text for comfort, scoured the Internet for plot rumors, and powered through midnight releases and subsequent readathons. The realization that tonight would end the annual anticipation that had become somewhat of an official holiday for me and many in my generation sat a bit heavier than I expected. However the final movie did not disappoint me in the least. While I don’t want to ruin the fun for anyone else, I’d love to discuss the movie so feel free to hit me up on Twitter or via email. I’ll just sign off with this: To Harry Potter, the boy who lived!